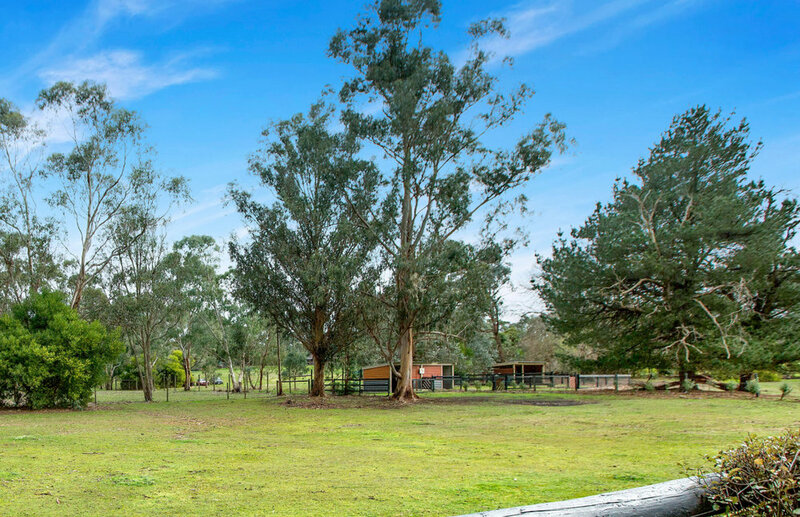 Located in a secluded pocket of Langwarrin and set on a picturesque 1ha allotment, Pendule is one of the original homes in the area boasting country style living with quiet family ambience. With an attractive Sandstone look front entrance, this 3 bedrooms plus study (or 4th bedroom) home showcases a beautiful Hampton’s style large kitchen with Ariston & LG appliances. Wooden benchtops with white vinyl wrap cupboards and huge Irish butler sink makes entertaining a joy. The recently renovated wet tiles bathroom with double shower and double basins with contrasting tiles compliments the wooden floors in living areas and brand new carpet in bedrooms creating a modern family living flow throughout. Spacious grounds on a beautifully flat block this country oasis is nestled amongst established gardens with extensive hedges, magnificent Oak trees and large outdoor and alfresco/entertainment area. · Garden Shed with workshop benches. · Made road and sliding gate with the facility to automate. See why Langwarrin has been dubbed the nation’s “most consistent market” in property research firm Hotspotting’s latest Price Predictor Index, making it the best option for house hunters seeking stable growth amid turbulent broader market conditions.